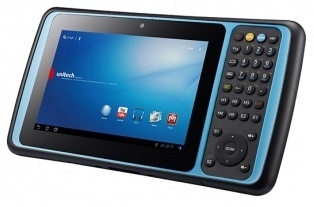 Unitech TB128 7.0” Tablet UHF RFID Mobile Computer - The new TB128 offers a superlative experience with a great list of unique features for ultimate flexibility and durability. This 7 inch industrial tablet PC adopts Quad Core 1.3 GHz CPU, Android 6.0 operation system and can configure barcode scanning, UHF RFID reader. Built in a physical keypad with programmable hot keys, TB128 is not only friendly and intuitive, but also smart as it helps enterprise users to operate long time in the inside and outside. This device is durable enough to be persistently reviewed in extreme temperatures or super heat environment. Moreover, it is able to survive a fall and suitable for logistic and retail applications. Powered by a 1.3 Ghz Quad Core Processor, and running on Android 6.0 operation system, TB128 provides superior fast performance and smooth operation as well as combining UHF RFID reader, 2D barcode scanning, NFC and 8.0MP auto focus camera in one durable tablet. In addition, it supports 802.11a/b/g/n wireless networks and Bluetooth 4.1 that fulfills high flexibility for field services workers to get connected anywhere.